Howdy! 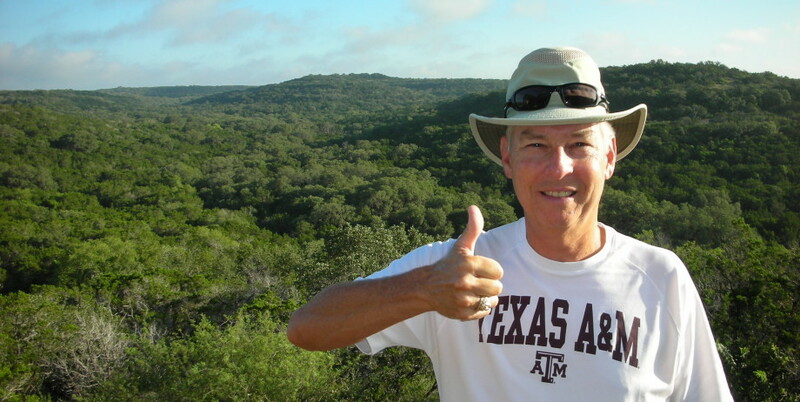 I’m John Ball, Texas A&M class of ’78, aka. “The Walking Aggie.” You may remember me from back in 2015 when I successfully made a coast-to-coast walk across America. Well, I’m out on the road again; this time with walking partner Dave Alcorn ’85. On 7 January 2019, we began a walk across the continent of Europe. As of 12 March, Dave and I have walked 988 miles across the mainland of Greece and the majority of Italy. But before I give you details about our European adventure, let’s briefly review my trek across America. Starting on 1 March 2015, and over the period of 170 days, I walked 2686 miles from San Diego, Ca. to Daytona Beach, Fl. The thru-hike was unassisted (no support vehicles following along) and uninterrupted (no extended breaks). Carrying all the supplies and equipment I needed in my backpack, and through the generosity of hundreds of kind people, both Aggies and just nice folks along my route, plus the support of family and friends at home, I was able to complete the coast-to-coast walk on 18 Aug 2015. The purpose of that walk was to create an endowed Aggie Ring Scholarship at Texas A&M. As it turned out, I was able to raise over $27,000 dollars, exceeding the minimum amount needed to create the scholarship. Donations were made by over 350 gracious donors and I’m happy to report that in each of the last two years, I and my family have awarded an Aggie ring to two student, both of whom were U.S. Military Veterans. This tradition will continue annually into perpetuity. So with that said, what’s the latest? First, I can’t begin to tell you what an amazing experience walking across the United States was. What an incredible adventure! The friends I made and the people I met were clearly the #1 takeaway from the trip and will be something I’ll never forget. But after I completed the walk, and had time to recover and then reflect on how rewarding the trip had been, I began to get that crazy feeling again. So about two years ago, I started considering taking another walk. But where to this time? After thinking about it for a period of time, and doing some tentative research, I settled on a plan to walk across Europe. And at that point, I contacted a friend, Dave Alcorn, in Tallahassee to see if he was interested in making the walk with me. Because of Dave’s Air Force experiences in Europe, he jumped at the chance. Our European walk is planned to be 2321 miles in 150 days. Unfortunately, due to European Union (EU) tourist visa restrictions, the walk can’t be done in one continuous thru-hike. EU rules state that an individual visiting Europe as a tourist can not stay for more than 90 days in a 180 day period. Therefore, the walk is divided into two segments with a 90 day return to the U.S. in the middle. Part 1 began on 7 Jan 2019 in Athens, Greece, and we successfully completed that segment of the walk on 12 March in Verona, Italy. Part 2 will begin where Part 1 ended in Verona on 11 June 2019. The trek will end on 4 Sept in Oslo Norway. In all, the walk will transit 7 countries (Greece, Italy, Austria, Germany, Denmark, Sweden, and Norway). As was the case with my walk across America, I’ve been wearing a Spot GPS device enabling our followers to track us minute-by-minute. In addition, we’ve been posting videos, photos, and a daily journal on this website to keep all of you up to date on our travels. Unfortunately, I must report that Dave Alcorn has made the decision to not participate in Part 2 of the European trek. Therefore, I will be walking solo from Verona to Oslo. As always, I’ll continue to post daily updates, pictures, and videos on this website. Dave (and John); We just got back from Bhutan and Nepal on Saturday. Our short walks there were spectacular, but nothing compared to your amazing trek which I am vicariously enjoying through your daily journal as are some of my friends including Gerda in Berlin. Wondering if love of hiking is genetic, bro?. Yes, it must be genetic, but you all do the real hiking. John and I just stroll along roads most of the time. We are not up in the mountains doing the real hiking like you and Sandy and your friends. Yes, it has been Pasta, Pizza, beer and wine! All the important food groups. My brother the European expert! Thanks Marshall but I’m no European expert. It has been fun so far though! Howdi How was the boat trip to brindisi?? Thanks Mikkel! The boat ride was very good. We enjoyed talking with you! Safe travels and best wishes to you and your family. Thanks. The ride was great. So excited to follow again-you popped up on my twitter newsfeed. Best of luck & BTHO out of the walk! OK JOHN!!!! SO SXCITED FOR YOU AND DAVE FOR THIS JOURNEY YOU’LL HAVE CHOSEN. SENDING MANY PRAYERS FOR SAFE TRAVELS. WILL BE CHECKING IN DAILY TO GET UPDATES. DENNIS AND I ENJOY SO MUCH FOLLOWING YOU. Thanks Nita & Dennis. You two are real friends. John and Dave: I look forward to following your big AUDACIOUS adventure! As a step counter myself, I estimate your trek is 5,802,500 steps (give or take), but only 5,802,499 after the first step. Sandy and I wish you a safe and great journey! Thanks Don! Merry Christmas to you and the family! Good Bull! All the best! My wife and I (both Ags ’89) and others from the Baton Rouge Aggie club had the privilege of housing John as he made his way through the area in Summer 2015. We look forward to the journal entries and pictures. BTHO the walk!! Col Alcorn, thought about you today as I watched the ceremony for President Bush. I shared with my co-workers that because of you – a humble Aggie – we enjoyed a short conversation with President Bush in the Dining Facility at Al Udeid AB. Hope you still enjoy every day and every meal as you did then. Thanks Robert! I enjoyed my time with all the great people like you at Al Udeid. Merry Christmas! Good luck! And there is a technicality around the Schengen tourist visa (too lengthy to explain here), but breaking the trip into 2 sounds good too. I send yall my prayers and I’ll follow the blog intently as yall go! Thanks, If you can send us the technicality around the visa issue that would be great. You can send it to John or my email. Thanks! So excited for you both. Col Alcorn…. well I am glad that you got to meet Mr. Ball in 2015. See where Aggies can lead you. I can not wait to follow you both and see what adventures you will have. Thanks Stephani, We are looking forward to the adventure.